This and 3 other objects are a part of a set whose first object is Dinette Tea Set, ca. 1928. This is a Tray. It is dated ca. 1928 and we acquired it in 2013. Its medium is pewter, ebonized wood. It is a part of the Product Design and Decorative Arts department. This compact fitted tea service, comprising a teapot, creamer, sugar bowl, and tray, is from the Dinette line of tea sets created by the International Silver Company’s Wilcox Silver Plate division. The sets were targeted at modern-minded women as space savers for the smaller rooms common in most city apartments, and the line’s design was considered revolutionary when it was launched. Although the Dinette line was first developed by the International Silver Company’s in-house designer, Jean George Theobald, whose background was in jewelry design, the company engaged self-described “decorative arts consultant,” Virginia Hamill, to refine the forms. Hamill was one of the few women practicing product design in the 1920s and 30s, a time when industrial design was still an emerging field. Hamill played an active role in developing design exhibitions, particularly in American department stores and retail showrooms where displays of the latest home furnishings and ware could reach a wide range of domestic consumers. The design of this set, the most capacious of the Dinette line’s three models, shows an emphasis on function and process. It utilizes clean, simple cylindrical forms with flat, circular, tightly fitted lids and trapezoidal ebonized wood handles, which are easy to grasp and hold. The teapot, sugar bowl, and creamer nestle closely together in the shaped carrying tray. The level of sophistication demonstrated by this Dinette set is not surprising given Hamill’s extensive exposure to modern European metalwork, such as designs by Jean Puiforcat in France and Marianne Brandt of the Bauhaus in Germany. The example proposed for acquisition is made of polished pewter and was produced by the Old Colony Pewter firm as a less costly alternative to International Silver’s silver-plated metal sets. Pewter is durable and easier to clean than silver, a convenience that homemakers appreciated, and its lower price point spurred the material's rise in popularity during the Depression. Aesthetically, polished pewter exhibits a softer luster than chrome-plated metal, which was another popular material of the era. The Dinette tea sets could also be customized with the addition of a monogram; in this example, a block letter G is prominently engraved on each piece in the group. 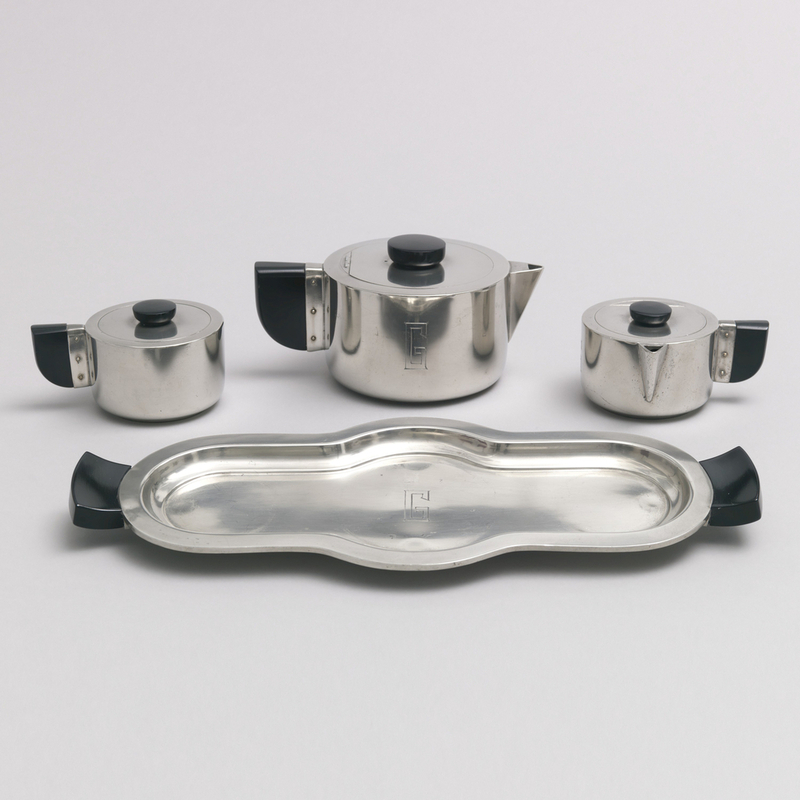 This innovative modernist service presents an interesting departure from the historical and colonial revival forms more often associated with American pewter of the early 20th century. It would be a significant addition to the museum’s metalwork holdings and would be the first example of work by Theobald and Hamill to enter the collection. This object was donated by Marilyn Friedman. It is credited Gift of Marilyn Friedman.